This guide was created because we have never subscribed to being or doing enough. We want everything we do, this guide included, to be in that uppermost percentile. If folks are saying “you don’t need to do all that,” or “they are taking this way too far,” then I feel like we have done our job. 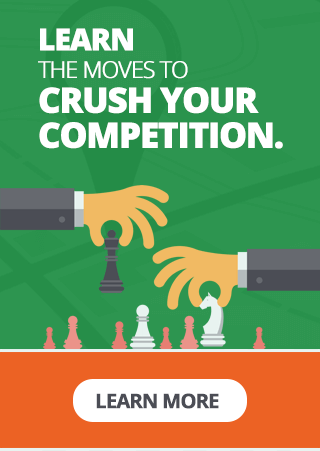 This guide walks you through the simple process of figuring out what competitors in your niche/market are doing to propel them to the top spots, locally. More specifically, citation-wise. Let’s get to it, shall we? In a hurry? Grab our template competitive analysis template before you leave. We need to collect citation sites as a first priority. This will be done using the Whitespark Local Citation Finder. Note: You need to subscribe to their package in order to view all possible citation sources. Login to your Whitespark account. Click “Tools,” and choose “Local Citation Finder”. On “Keyphrase Search” tab, enter your target location and keyphrase. Note: Choose the most relevant category to your business for the keyphrase. The more popular it is, the greater the number of citation sources might attached to it. Once done, go to “Your Search Results”. Look for the searched keyphrase. Check the quantity of citation sources. If you think you have enough, proceed to the next part of this guide. If you think there are too few sources, you can search for more keyphrases. 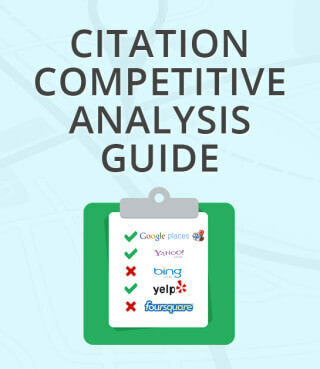 In this part, we’ll compare citation sources from your competitors. We need to find all the possible citation sources they used, so that we can take advantage of them. Click the keyphrase or “view sources”. Check the “Top Ranking Businesses”. 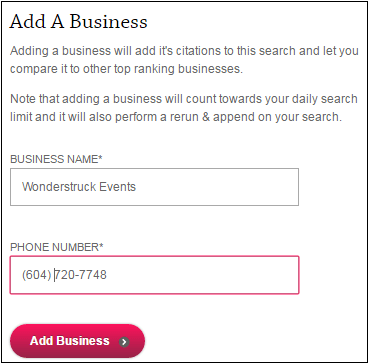 If your business is not listed, click “Add A Business”. If listed, proceed to step 6. Add your business name and phone number. Run the keyphrase again. This will allow Whitespark to audit your business citation sources. Once finished, click “Compare Citations for These Businesses”. Sort the results by your business, and then sort them to display all with a value of “No”, first. Transfer the report from CSV to your working report. 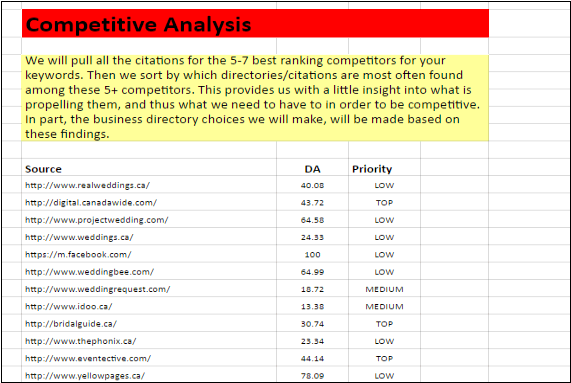 I will be focusing on top 3 competitors and only transfer the possible citation sources. Allow us to save you some time and provide you with our template. Repeat part II, step 1-8 to populate more citation sources from other keyphrases. In this part, we need to identify the priority citation sources. We will sort them with 3 labels; Top, Medium, and Low priority. To help us set the priority, we need the Domain Authority of each site, and each occurrence of “Yes” for each competitor. Top – 30 to 100 DA and 2 to 3 occurrence. Medium – 10 to 29 DA and 2 to 3 occurrence. Low – 0 to 9 DA or 0 to 1 occurrence. Check the domain authority of each site. To get the domain authority, use this tool for bulk checking https://expertseotools.com/bulk-domain-authority-checker . 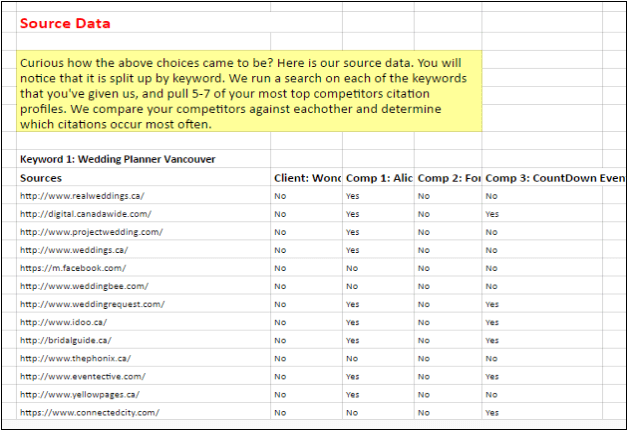 Check each row and record how many times each competitor used that specific site. Label each site according to our Priority Criteria. We’re now very aware of the citation opportunities and priorities in our space, but if you’re like us, you like to go the extra mile. PROTIP 1: Most people will focus on what is working in their space, but what of cities larger and more competitive than your own? Say the NYCs and LAs of the world? If you are ranking well there, you aren’t fooling around. Make sure you check out what top ranking folks there have in their citation profile. Don’t just make your citations better than the next guy, make them better than anyone in the damn country. PROTIP 2: I realize this is a competition analysis guide, but I would be remiss if I left this out: There are lots of great, DATA-BACKED, citation lists out there specific to your niche/city/country. Look for the ones that describe how the landed on their list(s). A household favorite is the one GetListed (now Moz Local) and D-Money (nickname I just landed on for Darren Shaw this very moment) put together many moons ago. If the list you are looking at isn’t at this level, it’s garbage. You’ve made it through our humble, little guide. You are officially a citation badass. It’s a thing. As always, we hope you have found it helpful, and if you have any questions OR SUGGESTIONS, please get in touch.